Complete output of Al Turk’s Princess Orch. made fo rhe Olympic and Okeh labels plus the best of Charlie Straight’s Orch. from Paramount, Brunswick and Vocalion. Al Turk (c) directing unknown (tb), (cl,as), (as), (ts), (p), (bjo), (bb), (d). Note: Supertone 1455 is credited to Albert Turk’s Princess Dance Orch. Al Turk (c) directing unknown (c), (tb), (cl,as,ss), (as,ts), (p), (bjo), (bb), (d), D. Harris-Earl Hayden [who may be members of the band] (v). 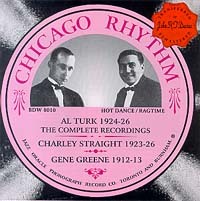 Gene Greene (v), accompanied by Charley Straight (p). Charley Straight (p) directing Lee Riley (c), Holmes Coltman (tb), Al Kvale (cl,as), Ray Puttnam (cl,ts), Julian Davidson (bjo), George Hookham (bb), Don Morgan (d). As above, probably with either Kvale or Puttnam doubling on baritone sax, and unknown violin added. Note: This issue is credited to Frisco Syncopators. Charley Straight (p) directing Gene Cafferelli and another (c), Randall Miller (tb), Bob Strong (mel,cl,as,vln), Frank Stoddard (cl,as), Dale Skinner (cl,ts), Frank Sylvano (bjo), Joe Gish or Gist (bb), Don Morgan (d). Note: Vocalion 15388 is credited to The Tennessee Tooters, which is where Rust lists these two sides. According to Rust, these sides were recorded on June 29, 1926. The matrix numbers are taken from the original record; note that track 24’s matrix number is at odds with Rust’s listing which is given as E-3316, probably due to the different matrix series used for Brunswick and Vocalion.